In our book, three's a charm! Here's why we can't wait to line up for Ines de la Fressange's third collab with Uniqlo. 1. Our Parisian Chic wardrobe needs an upgrade. Our shift dresses and breton shirts will forever be closet staples, but we won't mind shopping for more French-inspired pieces to amp up our inner je ne sais quoi. 2. It's like traveling to the South of France, but through our clothes. Ines de la Fressange herself designed this line with the South of France in mind, and features vintage-inspired prints and fabrics. Since we can't always jet set off to France, then we might as well live vicariously through our outfits! 3. Neutrals and naturals are the new black. We can't even begin to describe the impact neutrals have on our wardrobe--aside from being a perfect base for building our outfits, it's also an inimitable style staple. Ines dela Fressange's third Uniqlo collection features natural fabrics and colors such as sand, florals and linen cloths. 4. It's a timeless collection—and you can't argue with timeless, darling. When Uniqlo started collaborating with the French fashion icon, it was kismet--they immediately realized that Ines dela Fressange brought back timelessness to the brand. With the upcoming line's nylon jackets, button-down dresses and classic hues and prints, we forecast these pieces to make an extended stay on our fashion rotation. 5. It's versatile and easy to style, defining LifeWear to the core. When Uniqlo launched LifeWear, it was meant to define Uniqlo pieces as easy to style, and fit to be worn at any life event. The Ines dela Fressange collection fits perfectly into the LifeWear concept, as it's best to match with any existing Uniqlo piece. We're looking at it fitting well with each look on our OOTD list, whether Parisian chic or otherwise. 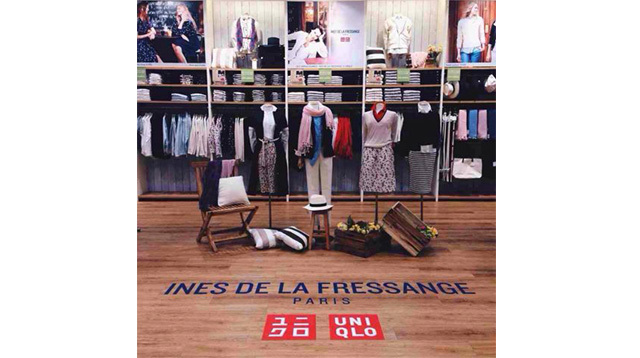 The Ines de la Fressange x Uniqlo collection is now available locally in UNIQLO SM Aura, SM Megamall and Glorietta 5.